Since this is a question that has been asked several times over the past weeks, we decided now would be a good time to discuss what actually drove our decisions. A few years ago, we allowed a local large-scale dairy farmer to utilize the 80-ish acres of tillable ground for producing crops for his farm. What we didn’t realize at the time was how he intended to use the ground. After tilling the soils around half of the farm this first year, we started noticing some issues with soil retention. We held conversations with him to communicate our concerns about the erosion and run off issues. Unfortunately, our concerns fell on deaf ears or he just didn’t care. He continued to till the ground from lowest to highest points, providing “alley” lanes for the water to just run toward our pond. Water wasn’t the only concern, it was also the over abundance of manure waste from his farm that he began applying as well. Every field slops toward the pond. Concerned over contamination of our pond, we started really paying attention to what was going on. Even to the extent of documenting through photographs what was happening. Our Department of Environmental Conservation started doing water samples too. Low and behold, the phosphorus levels started to increase in the pond water. Not to the point of dangerous…but close. All the water funnels to a pond…can you see the “silt” along the ice? There are ways this could have been prevented all together! 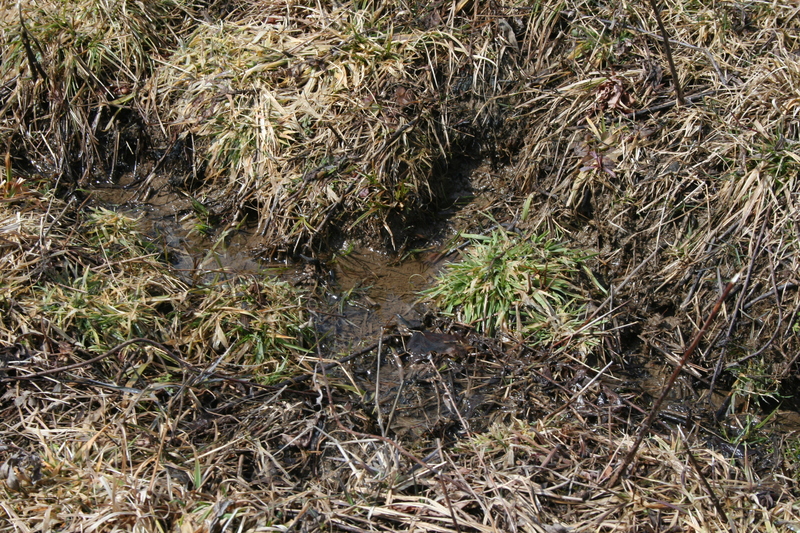 With just the simple motion of NOT plowing the field straight up and down the slope, much of this erosion would have stayed in the field instead of heading directly into the ponds. Cover crops that establish root systems would have worked too. Unfortunately, neither happened and now, we as the land owners need to repair the damages. 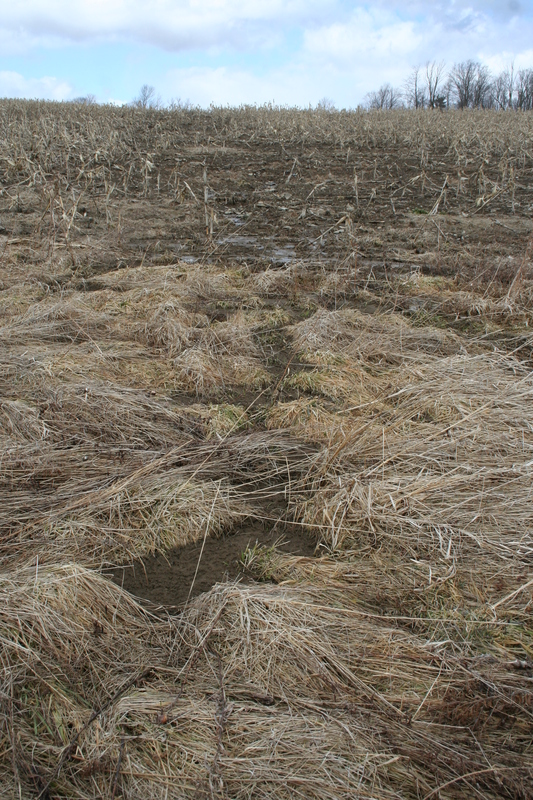 What started out as major concerns over erosion and run off, we stumbled across some information that has undoubtedly changed the course of our entire farm. The recommendation to start rotational grazing for our small herd of cattle has altered our whole perspective on farming. In April of 2012, we started rotational grazing on the lone 4-1/2 acre piece of the farm that wasn’t plowed up and bare dirt. We spent around $800 for step in post, braided wire and an energizer. It took us a few hours to put in the posts and another couple of hours to string all the wire. We started grazing April 1st, 2012. 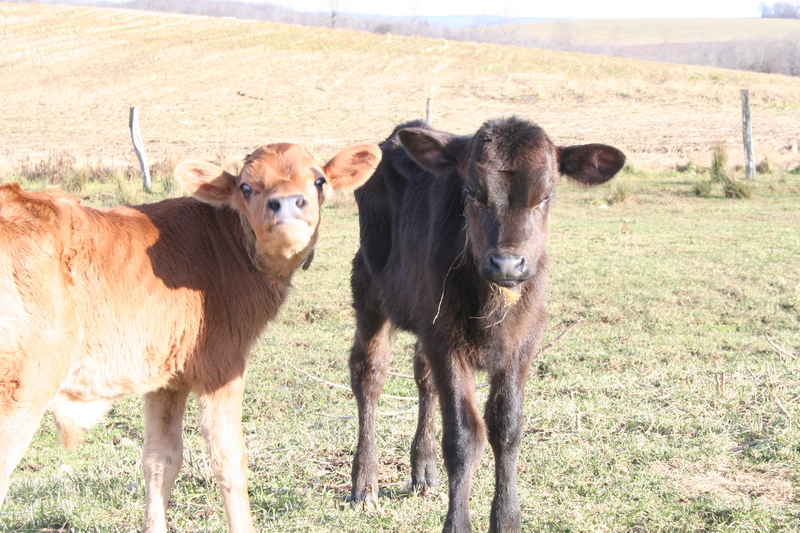 We started noticing after the first month that the grass was getting greener in spots from the cow manure patties. We started noticing less and less water running across the field too due to the small pieces of matter laying between the plants. We noticed that our grass was still growing in July when every one else’s in our area had dried up and turned brown. Benefit after benefit started to show. We planted the highest elevation piece into grasses for hay and future grazing too. 30 acres were planting with grass and legumes. After the first three weeks, we noticed less and less run off from that field too! Another 14 acres was reseeded and we started noticing spots of no growth. That got us to wondering why some spots were growing great and others barely at all. After walking through the field, the explanation was simple! All of the topsoil was GONE! Literally, it had all flowed off of spots and deposited in others. All that was left was the shale rock base. We knew right there that something had to change dramatically! After talking with our Natural Resources Office and our local county Soil and Water representative, we all came to the same agreement. Based on the success of our rotational grazing trial and the erosion issues, we would all work together and apply for some grant funding to put the entire farm into Managed Grazing. March brought us the approval and the contracts for two separate programs! We are happily reporting that the full 90 acres of acre we deem as “farm” will soon be pastured and used exclusively for rotational grazing and hay production ONLY. There will be no more tillage, other than by cattle hooves. Which do you think would be better if it was your property? Water draining out of the pasture. Well, now that things have kind of fallen into a routine…it’s time to get back on track with updating. We are excited to say that we are now collaborating with a store front located in Binghamton, NY called Old Barn Hollow. We have been sending our eggs to their newly opened store front for about a month now. It is so great to be able to share our eggs with some of the fine folks within the city that are purchasing local food goods! I am excited to see how they do and know in my heart that this is just the start of a great adventure! Second, we send our fast growing meat chickens over to a USDA certified butcher shop that is now open locally too! Cascun Farms is now the only processor I know of within our area. When talking with them after our birds we processed, we discovered that our ideas on how to support, increase awareness and generate fair income for local small farms fall right into line with each other! Andrea is a joy to work with and we have been collaborating on developing some ground work for some future developments. Andrea has a ton on her plate right now with being a mom of three and operating not only a farm herself but also being involved with the poultry processing. Both her and her husband have been working very hard at setting up meetings and looking into new market avenues for small farms within the upstate New York regions. As time goes on and more things come online…I will start sharing the progress. As for us….we are now chugging away with 18 head of cattle (including a couple of dairy heifers that I am super excited about), around 60 chickens and 15 turkeys! It’s really hard to believe that just four short years ago there weren’t any farm animals here! They seems to be multiplying all over the place! All of the turkeys that we grew since this summer are no spoken for as well! Twelve are headed to Cascun Farms for processing…with four to return and just two for us to keep! Unfortunately, that means no remaining for us for the rest of the year…but it just means I can get more birds in the spring! We have sold and eaten some of our pasture raised Rose Veal now too! 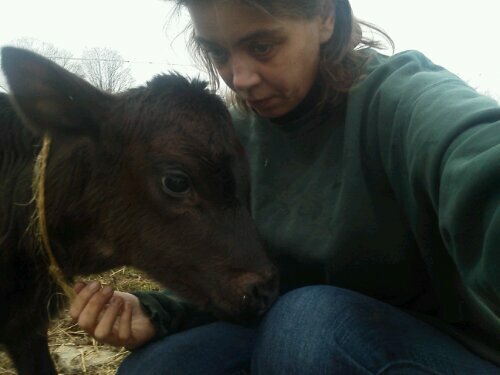 There is much conversation all over the place about what we do with these unwanted bull calves and why. We know have an amazing brochure that explains the basics in detail as well! Now I have been talking with a few local restaurants and a whole sale supply chain on developing some new markets as well. Several folks have requested some samples and I can’t wait to hear what they say about the product…I know that we have worked hard to do the right thing by these fellas and I know it shows through in flavor and texture! So many things have been happening all at once that it has been extremely difficult to keep up with everything….but now that a couple of things have been changed around, I find myself with an extra few minutes everyday to be able to get back to doing what I love to do so much……Go figure! It’s talking about the farm and the animals! Make sure you stop by and visit our facebook page too. We are posting conversations and sharing lots of photographs! You can see how well the animals did on rotational grazing this summer and even get to see some of the fantastic meals we eat! We will be running some specials for ordering very soon too so don’t forget to click that like button! People ask me questions sometimes that make me really sit back and ponder life in general. My answer is simple, yet complicated. I love cows! I love chickens! I love animals…period! 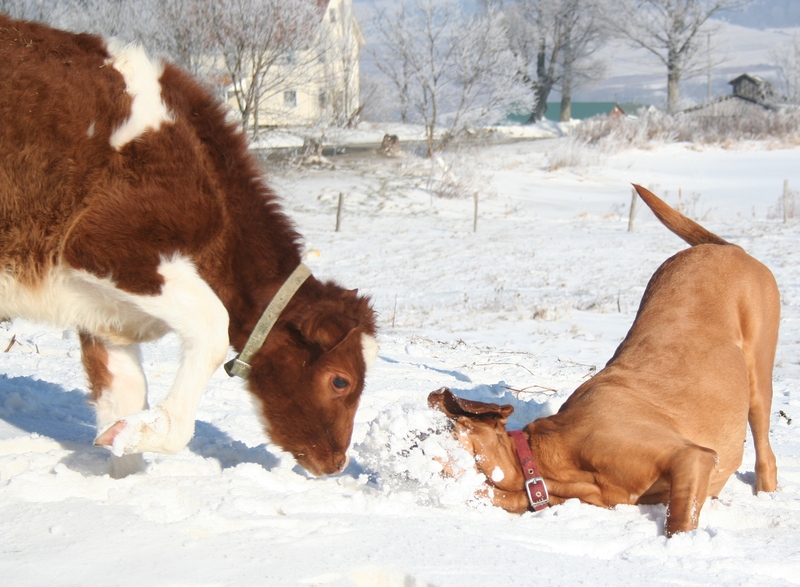 Bubba J and Rosie playing in the snow on a warm winter day. Then of course, there is the food stuff! 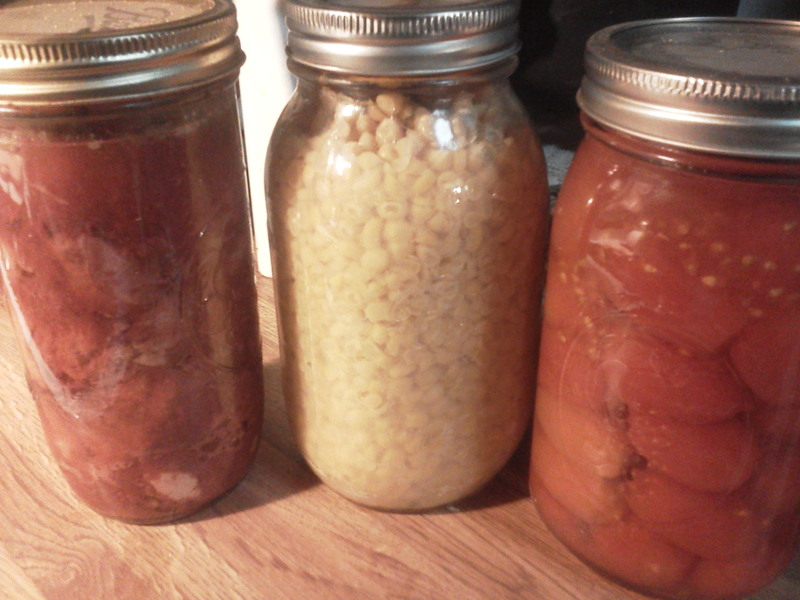 From canned, stewed tomatoes to home grown sweet corn, making cheese to eggs for breakfast…without the farm, I wouldn’t have those things like I do. There are a ton of reasons on this one. One of them isn’t the taxes, I do need to specify that! There is an easy answer to this one! It’s the sunrises/sunsets. It’s the views. 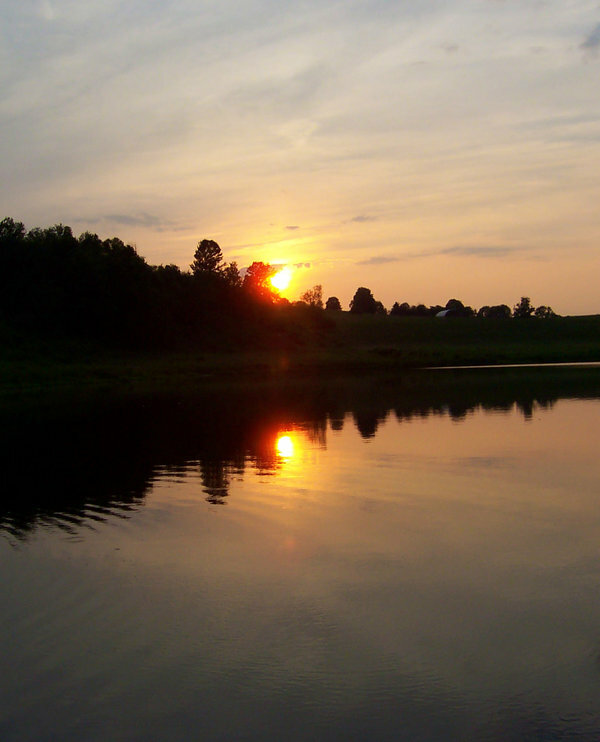 It’s the private pond….and so much more! There are many more questions and a whole lot more answers…..But I think this will give anyone a good idea on why I love farming. I think it will also give you a fair idea on why I love being here! 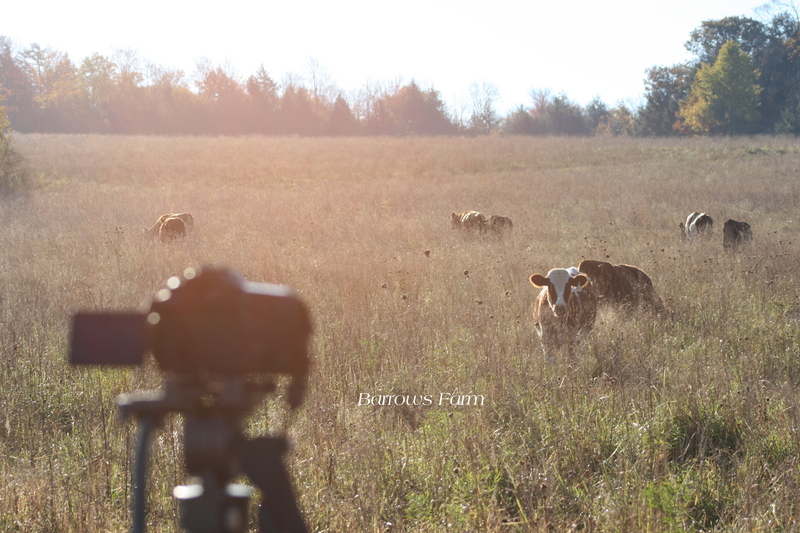 Of course, Mr. Farmer has one very big reason……this land has been in his family for 6 generations! The deed reads out like a genealogy report! 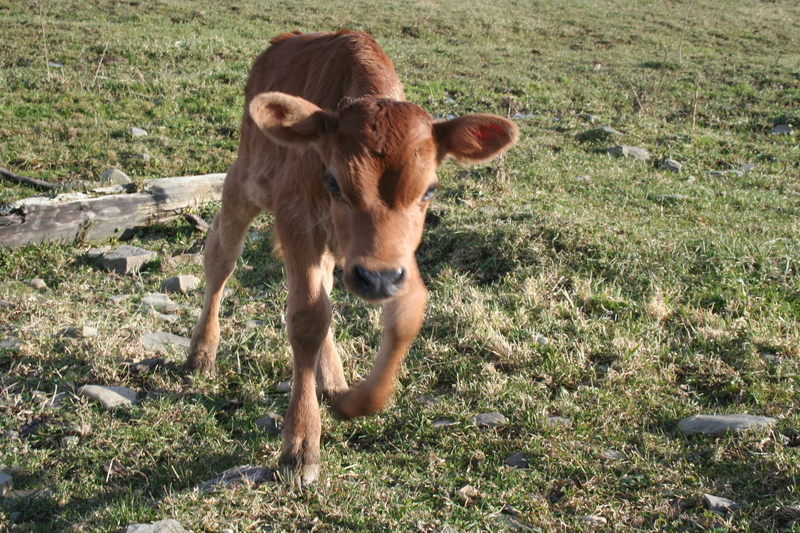 When the weather is nice outside like it has been lately here in NY (60 degree the last week in November), I like to let the calves out to get some exercise. It gives them time to stretch their legs and play. 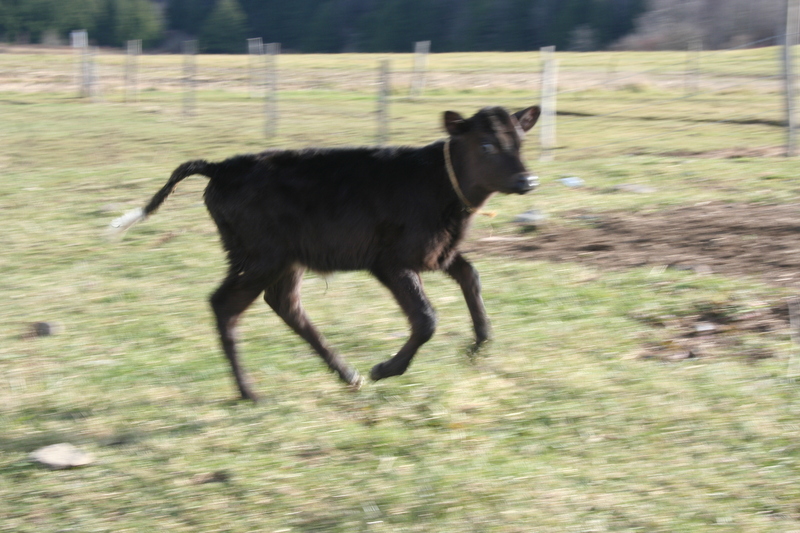 Katie, shown above, really enjoys running around the pasture as fast as her body will allow her to go! 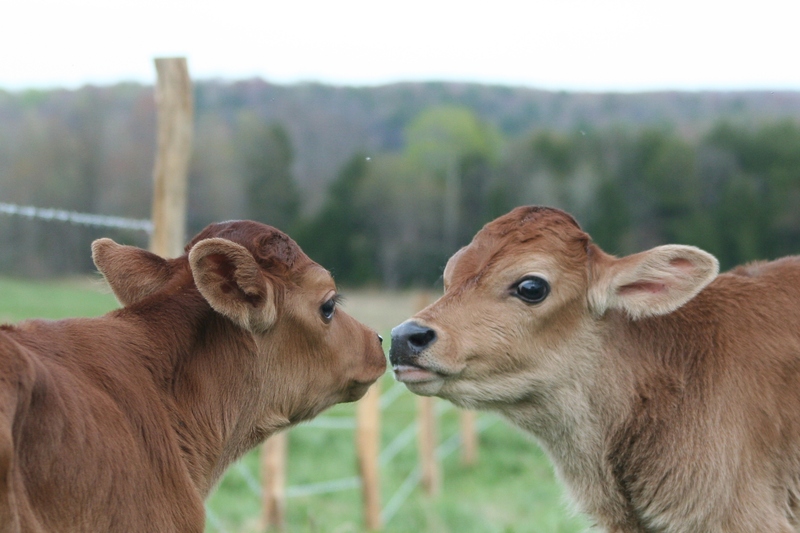 It also allows the calves to mingle and socialize. That is…IF they don’t follow me around like puppy dogs anyway. DJ is my best bud and I really enjoy spending time with him…with both of them actually! I try to find the good in everything. No point in focusing on the negative all the time…one of the reasons I rarely watch any other news than AgDay. With the leaves gone of the trees and the grass slowly turning brown too, I turn to other things in nature that I like. I like watching the sun come up on a frosty morning as the rays just start hitting the crystal and you can see every tiny detail along the edge of a blade of grass. It works the same for those mornings when we had a smidge of snow overnight. The animals are usually very quiet at that time of day. You might hear the rooster crow or the flap of turkey wings here on our farm but usually the only other sounds you hear are the wild birds chirping their good morning to the sun. As crazy as it may seem, that is my favorite time of day. I take my coffee cup (insulated of course) out while I do my morning chores. 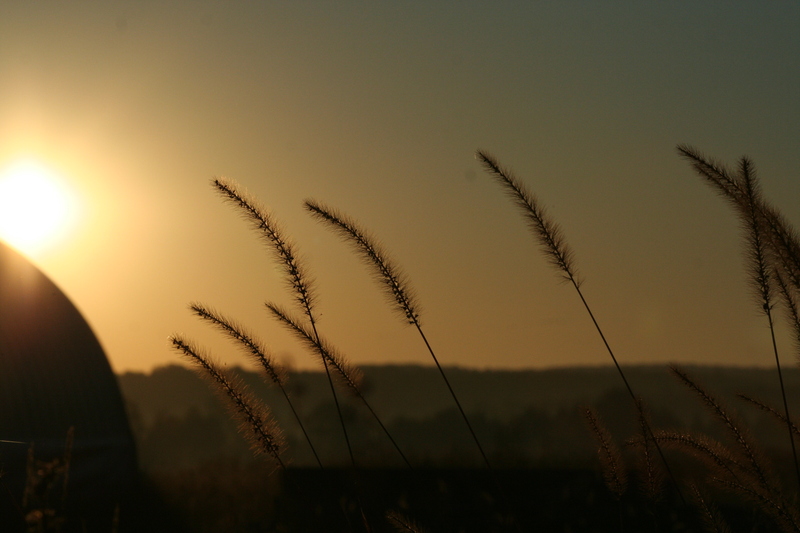 I have been known to be found leaning on the side of the barn, hands curled around my cup and bundled in about four layers of clothes watching the sun crest over the horizon. Everyone else changes their clocks, gets an extra hour of rest but not me. I still get up before the sun. I live somewhere where the old adages of “red sky in the morning, sailors take warning” doesn’t seem to apply. We have a red sky every morning. Of course, we also have the most spectacular sunsets too. At sunset, I am usually back in the barn again or close to it. There is nothing as peaceful as watching the sun sink below or peek over the horizon. It paints the clouds in the sky in spectacular colors. 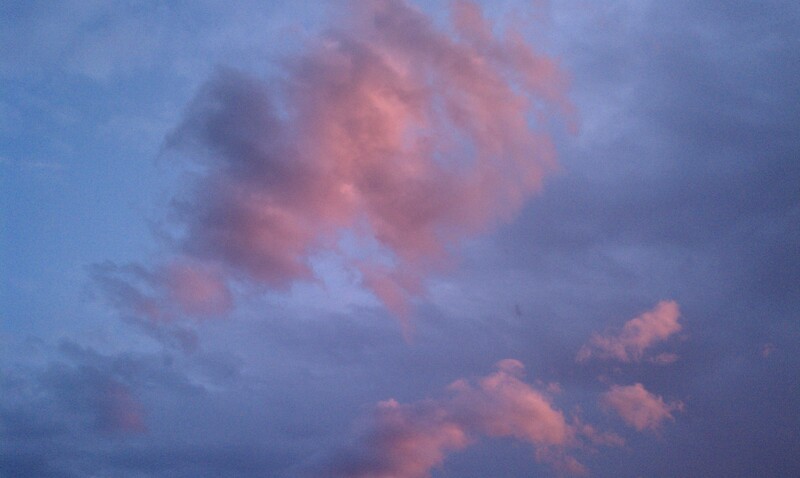 The setting sun paints the clouds pink. 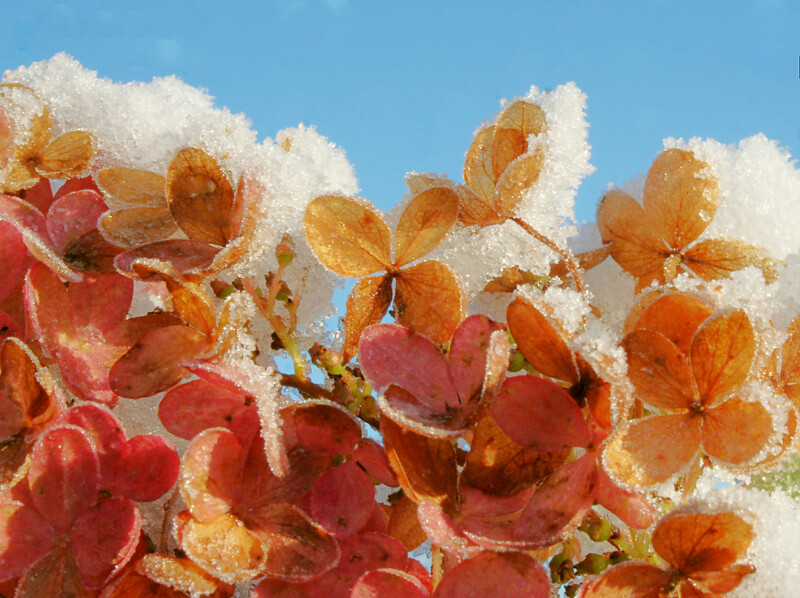 The orange of the morning sky makes everything look warmer with hints of orangy-gold. 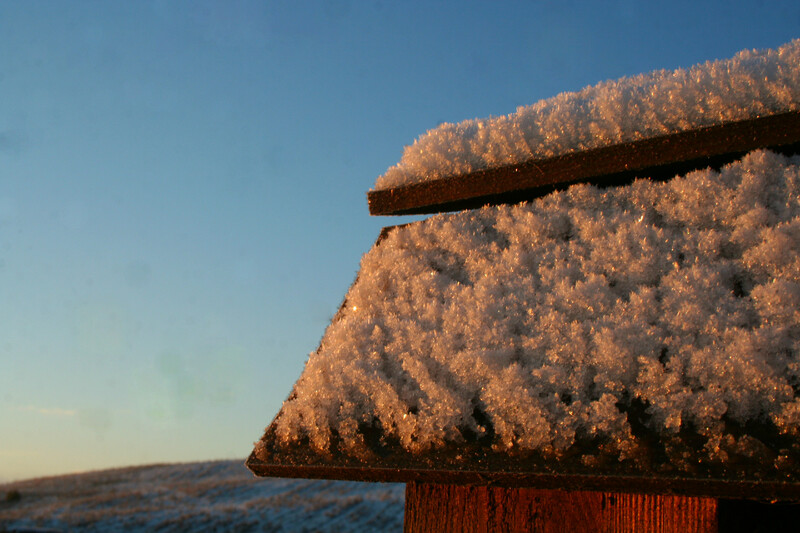 The snow of the top of our mailbox as the sun comes up. Farming life isn’t always about the hard work of feeding animals, cleaning barns or harvesting crops. There are those little moments that only country living can supply. 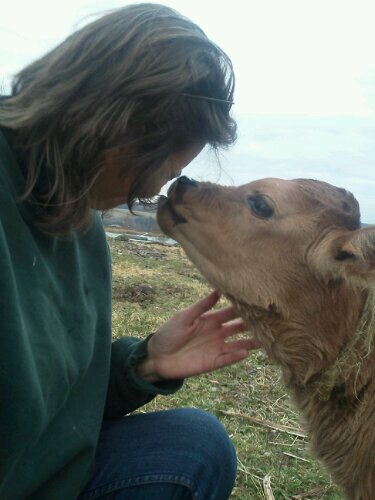 To me, farming isn’t only about the animals, it’s about a way of life. Some people thrive in this environment. I am one of them. I could tell you about countless others that feel that way too. We don’t really care about fashion trends, unless maybe it’s for a new pair of boots. We don’t care what the latest celebrated gossip is. The things we care about the most are our animals and the weather. Needless to say, those are fairly time consuming and the rest…well, we take it one day at a time.